Melissa is a Registered Dietitian who holds both a Bachelor Degree and Masters in Applied Nutrition from McGill University. Throughout her practice Melissa has assisted individuals in managing their weight and improving their eating habits. Being an avid runner and swimmer, Melissa became interested in sport nutrition and has completed her Sport Nutrition Diploma with the IOC (International Olympic Committee). Melissa is now Sport Nutritionist at the Canadian Sport Institute of Ontario, working with provincial athletes where she focuses on meal planning and eating around training and competition. Melissa’s goal is to assist her athletes improve their performance and achieve a balanced nutrition through proper food choices. Soy milk is great snack, providing 8g of protein and 2g of fiber per 1 cup. It doesn’t need to be refrigerated unless opened and is a healthy alternative to milk. Make sure that the product you choose is fortified with vitamin A, D and Calcium, since it does not naturally contain these nutrients. Many brands offer convenient formats of 200ml and 250ml bottles, which are easy to carry such as Soy nice and Natura. The natural soy milk and vanilla flavored would be the ones with the least sugar content. Don’t like soy milk? Ultra High Temperature (UHT) milk does not need to be refrigerated either! UHT milk has been pasteurized at Ultra High Temperature, which gets rid of the bacteria that usually requires it to be stored at cool temperatures. These portable packs can be found in most supermarkets next to the milk powder and/or coffee section. The products come in natural, chocolate and vanilla flavored. Choose the unsweetened version more often for a lower sugar protein packed snack. Fresh fruits are loaded with good-for-you nutrients such as vitamins, minerals, fiber and natural sugars. Single fruits like apples, bananas, pears or nectarine are particularly easy to carry. You can also mix up your favorite fruits in a small container depending on the season like pineapples + berries during summer time and citrus fruits such as tangerines in the winter. What better way to enjoy a healthy sweet & savory snack packed with protein and fiber! Simply toss together ¼ cup dried fruits like raisins, dried cranberries, blueberries or apricots + ¾ cup whole grain cereal + ¼ cups seeds/nuts. When choosing a cereal for this snack, look for those that have at least 2-3 g of fiber and less than 10 g of sugar per 30g serving. 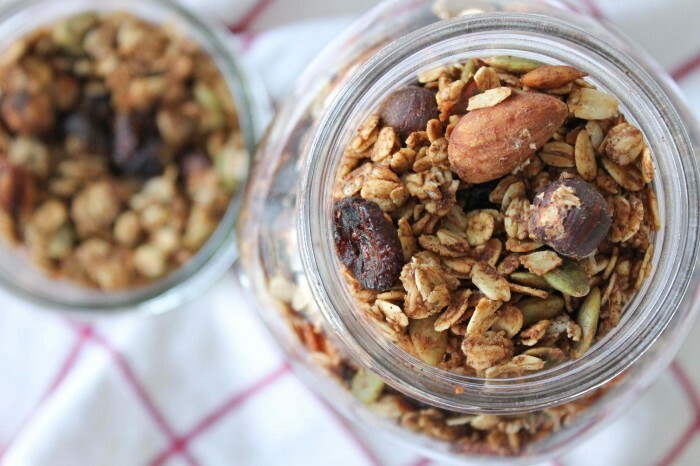 Granola bars are an excellent quick fix for the common energy slump that usually kicks in the afternoon! Make sure you choose the right ones by reading the product’s nutrition label. Look for the bars that have at least 2 g fibre, 2-3 g protein and less tan 10 g sugar per 30g bar. Some star brands that RDs love, are Kashi, Nature Valley, Q’ia and Taste of Nature.